This got buried by an avalanche of newer posts. February is a short month and February 28 is just around the corner! Running until the very last millisecond of February in the eastern time zone, coupon code FILMFEB02A gets you a FREE ROLL of FILM with the purchase of any film camera of $49+ at KEH Camera. As usual, their shopping cart is the ultimate decider on what qualifies. RAWsumer couponization time! Coupon code FEBFLASH drops the price of the new condition Canon G9 X rawsumer from $400 to $265 with free shipping in your choice of black or silver at the official Canon USA store. The coupon ends at the end of the month or earlier if sold out. The Canon USA store has this camera in both new condition and refurbished. The above is new condition! Speaking of the official Canon USA store, they have launched their Presidents Day Refurbished sale. Previously, in mid December 2017, Adorama offered this with a $50 gift certificate instead of a $100, but it included some free accessories. It’s instant camera action again! Amazon itself is bundling the Fujifilm Instax Mini 26 instant camera (available in four different color schemes) with a Rainbow Film bundle (ten exposure sheets) for $55 with free shipping with up to three bundles per color per customer. This is not a lightning deal so expiration time is unknown. More RAWsumer coupon action! The official Canon USA store is offering the manufacturer refurbished Canon G7 X Mark II for $450 with free shipping and a 1-year Canon USA warranty when you enter coupon code GFLASHDEAL over there. The price before the coupon is $500. It is in-stock as of the time of writing. The same coupon can get you the new condition Canon G9X first generation for $270 with free shipping and 1-year warranty. PS: the Canon USA store has a mix of new condition and refurbished products, sometimes even in the same promotional listing page, so always pay attention with regards to the new vs refurbished condition. The first generation new condition Canon G9X in either the black or brown color scheme drop from $400 to $270 with free shipping and full warranty using coupon code GFLASHDEAL at the official Canon USA store. Leica’s instant camera is on sale, but so are more of the Fuji Instax models. This time it is the new condition Fujifilm instax mini 8 Instant Film Camera going for $50 with free shipping at B&H Photo in the tile blue or plum color schemes. The avocado color scheme (don’t put it in your salad though) goes for $48.95, however, you don’t get free shipping unless your order total is $49+, so you’d need to buy something else to get free shipping. The last time we mentioned the Sony RX100 Mark V it was getting a $50 house gift card, but now B&H Photo has upped the ante. For the same price of $948, you are getting a $100 B&H Photo gift card and a 64GB Sandisk Extreme card, and a carrying case and FREE NEXT DAY delivery as well! Canon gone wild! The official Canon USA store is offering the new condition Canon G9X rawsumer in silver/tan or in the black color scheme for $300 with free shipping and a Canon neckstrap… Optionally you can get $200 if purchased together with the Canon Connect Station CS100… Both colors are in-stock as of the time of writing. On the instant film front, the new condition Fujifilm Instax Mini 26 with a Rainbow Film Bundle is on sale for $60 with free shipping at Amazon by Amazon actual with up to three bundles per color per customer. The camera is available in four different colors. It averages 4.5 out of 5 based on 440+ customer reviews and has 60+ answered questions. We already mentioned that the Sony RX100 Mark V went down $50 (from $1000 to $950) and is getting a $50 gift card as well at select authorized dealers, but when comparing to our most recent Fixed Lens Cameras Price Chart, we hadn’t posted that two other RX100 models dropped $50 as well (but they are not getting a $50 gift card). While updating the Stock Status Tracker, I noticed an interesting development! The black Fuji X100F is down to $1274 at Amazon by Amazon actual with up to three per customer. The usual Fuji X100F is $1299. The amount of the discount is obviously not big, but an X100F discount is a rare thing from non-importers! A sign of the shape of things to come or some random price change by the Amazon AI Price Bots? The sale is good for the black or the silver color scheme. A number of Panasonic gear continues to be offered with either free gift cards or free lenses, find those in our earlier Panasonic posts. While digging into the Amazon Gold Box, lost in a sea of recurring camera and photo accessories was this surprise “Upcoming” deal, the new condition Canon G9X rawsumer will be a lighting deal on Tuesday December 12. PS: there is a small chance this may get cancelled or rescheduled. The vast majority of previously scheduled lightning deals go live as expected, but a small number of them get cancelled or rescheduled. I have no way of knowing this ahead of time. Amazon gone wild! The new condition Canon SX530 HS superzoom is on sale for $210 with free shipping with a limit of up to three per customer. This is sold and shipped by Amazon itself. This is not a lightning deal, so expiration date is unknown. It averages 4.3 out of 5 based on 380+ customer reviews and has almost as many answered questions. This is a 50x optical zoom camera with a lithium-ion battery. The new condition Canon G7 X Mark II rawsumer goes for $679 in new condition at authorized dealers with free accessories (eg B&H Photo, various at Amazon) or if you are willing to do the mail-in rebate song and dance, you get it bundled with the Pixma PRO 100 printer and 50pk paper for $679 after a $350 mail-in rebate through Adorama. But if you don’t want/need the Printer or hate the idea of doing mail-in rebates, but still want to get a 1-year Canon warranty, you can get it for $450 with free shipping as manufacturer refurbished from the Canon USA store. You also get a free Canon Leather Case PSC-5500. The Canon G3X RAWsumer goes for $800 in new condition at authorized dealers with free accessories such as B&H Photo, or if you don’t object to doing the mail-in rebate, you can get the G3X bundled with the Pixma PRO 100 printer and 50pk paper for $800 after a $350 mail-in rebate through Adorama. But if you don’t want/need the Printer or hate the idea of doing mail-in rebates, but still want to get a 1-year Canon warranty, you can get it for $500 with free shipping as manufacturer refurbished from the Canon USA store. You also get a free Canon Leather Case PSC-6200. Zoom zoom to the eBay deals we go where the Beach Camera eBAY store is offering the manufacturer refurbished Nikon Coolpix B500 superzoom in the red color scheme for $160 with free shipping and a 90-day Nikon USA warranty. You can buy up to five per customer at this price. This is a 40x optical zoom camera and it is powered by four AA batteries, so a plus for fans of rechargeables. Speaking of superzooms, there are a number of active superzoom deals at the moment, a good chunk of which are from Panasonic. A lot of Panasonic Cameras and Lenses get free gift cards with purchase at Adorama, but that’s not all. The Panasonic ZS70 instead of a gift card it gets bundles of free accessories for the same authorized dealer price of $398 with free shipping. The offer is available for the silver or black color scheme of this 30x travel zoom. Don’t cry for me walletina! The gift certificate now matches the model number! The silver color scheme of the Panasonic LX100 is bundled with a $100 Adorama gift certificate and $24 in promotional rewards at Adorama. Meanwhile the black color scheme gets a $50 gift certificate instead. This is a RAWsumer with a “M43rds” size sensor. The same price is available at B&H Photo with free accessories but no gift cards. At Amazon, only 3rd-party sellers offer free accessories but no gift cards. 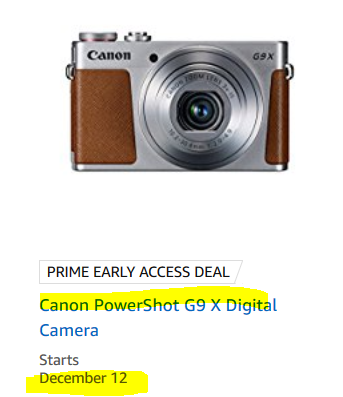 This camera went for $800 when I posted the RAWsumer Price Charts in early November 2017. No gift card at B&H Photo but you get a 32GB Sandisk Extreme SDHC and a pouch. No freebies at all at Amazon. We have another Panasonic ZS-series bundle! This time it is the 1-inch Panasonic ZS100 with its 10x optical zoom. And there are two competing freebie bundles. Adorama offers this bundle for $548, a $80 Adorama gift certificate, AND the Panasonic DMW-BLG10 Li-Ion Battery & Charger Travel Bundle (which as the name suggests includes a charger and a battery). B&H Photo offers this bundle for $548: $50 B&H Photo Gift card, a 32GB Sandisk SD memory card, a camera pouch, AND the Panasonic DMW-BLG10 Li-Ion Battery & Charger Travel Bundle (which as the name suggests includes a charger and a battery). This is available in the black or silver ZS100 color schemes. The ZS100 on its own standard retail kit goes for $548 with free shipping without the freebies by Amazon itself and other authorized dealers, so you are getting a nice set of freebies for the same price! PS: also available is gift card bundle offer for the Panasonic FZ300 superzoom. Don’t stop believing superzoom fans! The Panasonic FZ300 superzoom (40x optical zoom) with RAW is bundled with a $50 Adorama gift certificate and $18~ promotional rewards for $448 with free expedited shipping at Adorama! You can optionally triple the warranty by filing with Panasonic. This goes for the same price but without a $50 house gift card at B&H Photo (with 32GB Extreme SD and bag) and by Amazon itself. The Panasonic FZ-2500 superzoom had been getting a $100 gift certificate last week, but now the gift certificate has increased to $150 while the camera remains at $998 at Adorama. In terms of pure value, you can instead get it bundled with a Shure VP83F LensHopper Camera-Mount Shotgun Microphone (this goes for $300 on its own; same offer as last week). 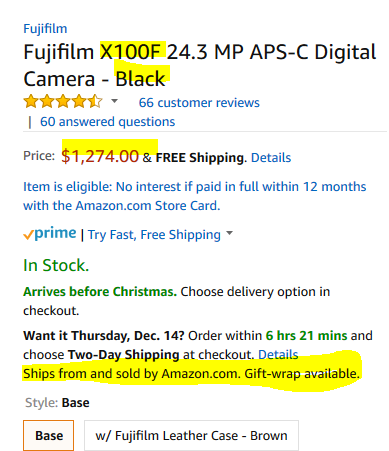 This camera went for $1200 when I posted the RAWsumer Price Charts in early November 2017. PS: no free gift certificate promotion is available for the Panasonic FZ1000.